Today I will show you a few animal masks by Hilario Álvarez Mendoza. The first is one that I purchased from the Old Pascua Community Center in Tucson, Arizona, in 2013. 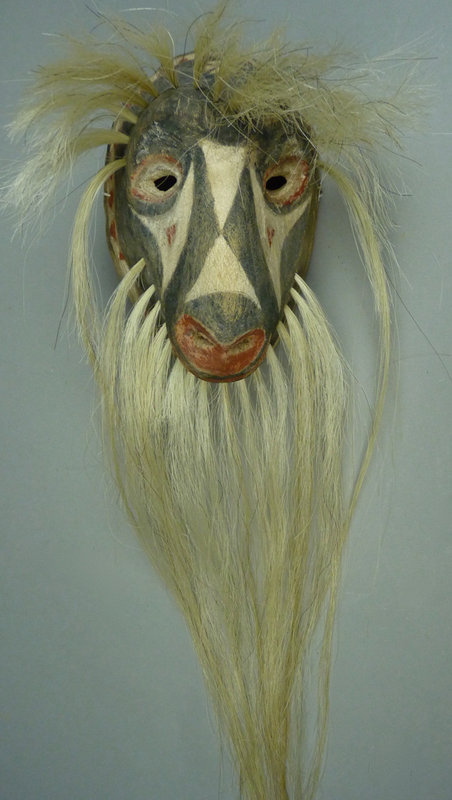 I was told that this mask had been worn by children from the Old Pascua community who were learning to dance. When you see the back, it will be clear that quite a lot of learning had taken place. This mask has the face of a dog. Like the masks in last weeks post, this one certainly has features that might remind you of the masks of Antonio Bacasewa, Hilario’s step-father. The forehead cross and the freehand designs on the cheeks are both typical of Antonio’s style. Furthermore, the hair bundles are pegged. The extended tongue, on the other hand, has an abrupt angular bend while those of Antonio bend more softly. Hilario Álvarez Mendoza is one of Antonio Bacasewa’s stepsons. He lives and works in Vicam Switch, which is the Vicam neighborhood near the railway line and the Vicam switching yard (http://mexicanrailroads.blogspot.com/2009/01/ferromex-nogales-to-mazatln.html). 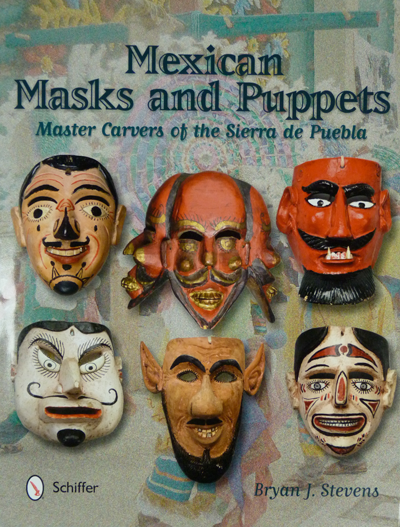 Tom Kolaz recalls that Hilario frequently brought up masks by Antonio from Sonora for dancers in Tucson. As you will see, Hilario carved in a style that resembled that of his step-father, although there are details that often differentiate their work. Today our focus will be on human faced masks by Hilario, and I will start with the mask that introduced me to this carver, an undanced mask that nevertheless has an interesting history. 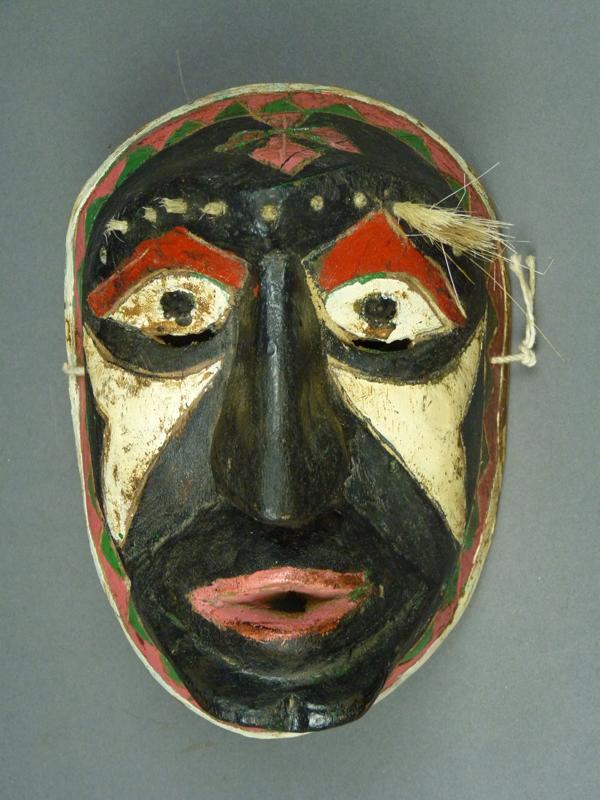 To begin with, this mask was originally collected by Barney Burns in Sonora, from the carver, in 1980. Barney sold it to an Indian arts dealer in Tucson, Mark Bahti. Mark then sold the mask to a Hopi silversmith, Larry Acadiz, who bought it to hang on the wall in his house. Decades later Larry sold the mask back to Mark Bahti, and I purchased it in his shop in 2013. On the back there was a typical Barney Burns pencil inscription—HAM 1/80, but I thought it was a mask by Antonio Bacasewa, and showed it to Tom Kolaz as an example of mislabeling. As you must know if you have reading the posts about Yaqui Pascola masks, Tom and I have frequently agreed that a particular mask has been attributed to someone other than the true carver; I thought this was just another example. Tom then told me about Hilario. Here is that mask. Last week I introduced you to Inez “Cheto” Álvarez, a Yaqui mask maker from Potam, Sonora. Today’s animal faced masks will expand your experience of his talent. Some are from my collection and the rest are from the collection of Barney Burns and Mahina Drees Burns. It seems that Cheto developed specific designs for his animal Pascola masks, so that he made at least several copies of each design. I will begin with one from my collection that I bought on EBay™ in 2002. 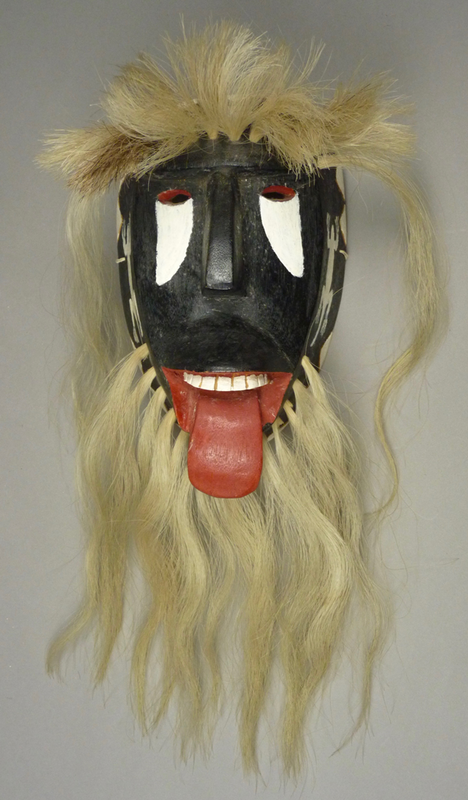 The seller reported that she had purchased this Canine mask in Tucson, Arizona in 1985, it had been made in Sonora, and she did not know the name of the carver. My friend Tom Kolaz immediately recognized this as a known design by Cheto Álvarez. 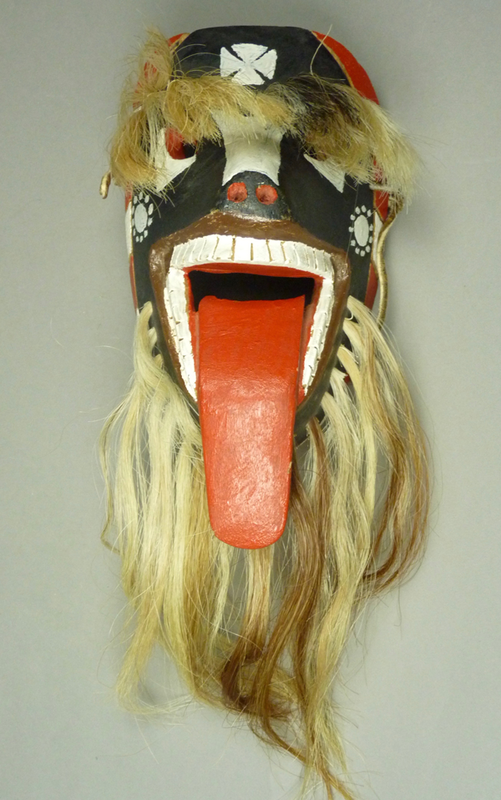 This is a Canine Pascola mask with an extended tongue and numerous sharp teeth. Now that I have completed a survey of the masks of Manuel Centella Escalante, I feel compelled to immediately follow with the masks of Inez “Cheto” Álvarez, an equally talented Yaqui master. It took me a long time to appreciate Cheto’s greatness, because at first I only encountered lesser examples of his work. Cheto and Manual Centella had overlapping styles, so that sometimes I was uncertain about which one was the carver. You have already met the son or stepson of Cheto, Camilo Álvarez Buitimea. 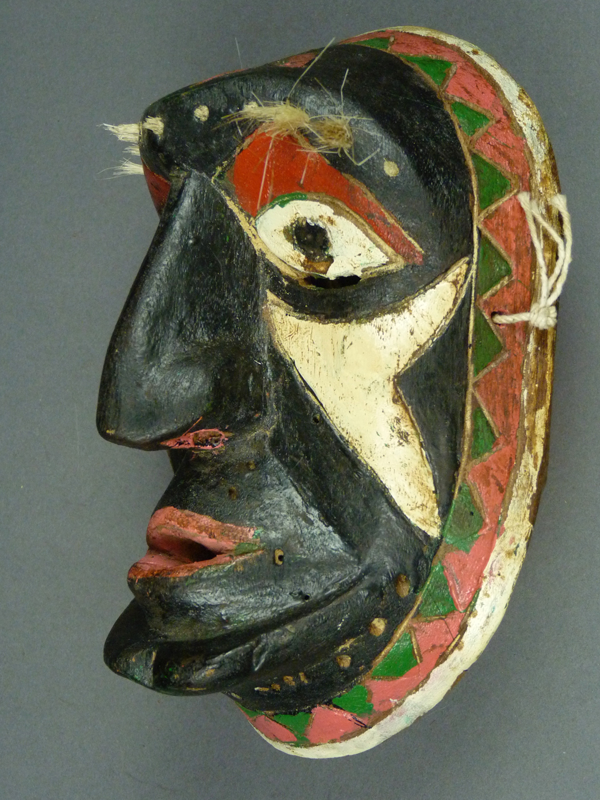 I will begin with a particularly good Cheto mask from the Barney Burns and Mahina Drees Burns collection. This one was collected in 1988. In the 1980s Cheto liked vivid colors. In this example the rim design is composed of lime green and hot pink triangles, within the same plain band used by Manuel Centella Escalante and Preciliano Rodríguez Cupis. Instead of the painted triangles over the eyes that were favored by Manuel Centella, Cheto often substituted an L-shaped eyebrow. The triangles under the eyes are particularly dramatic on this mask, oversized versions of those found on Mayo Pascola masks. The tiny vision slits are nearly hidden under the eyes. You may have noticed that Pascola masks with vision slits in that location are unusual. In earlier posts I included masks by Manuel Centella, Conrado Rodríguez Cupis, and Preciliano Rodríguez Cupis that had vision openings there; Centella’s were the most dramatic (see 12/26/2016 post). Recall again that all three of those carvers were contemporaries in the town of Potam, Sonora. Today we will examine goat faced Pascola masks that were carved by Manuel Centella Escalante, beginning with the mask I had told you about in my earlier post of 11/16/2016, one of those that was discovered in the house of Lino Suarez, the principal Pascola at Old Pascua, just before the bulldozer arrived to demolish the place. The mask was weathered and insects had consumed the hair, but it was otherwise intact. It was later re-haired by David Valenzuela. Here is that goat mask.